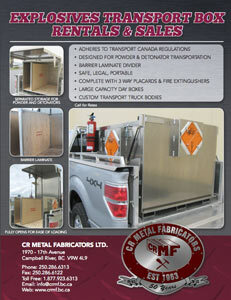 CR Metal Fabricators has developed explosive transportation boxes and bodies for the forest, mining, road building and oil and gas industry. They range from aluminum bolt-in boxes that fit in a pickup box with barrier laminate dividers between the explosive area and the detonator area, to complete carrier bodies fabricated from steel with non-sparking urethane lining, barrier laminate dividers, accessory storage cabinets and drill steel carrier tubes. All meet Transport Canada requirements. We also have a number of explosive transport boxes for short or long term rentals. Please see brochure below for rental information. Call us toll free to get rental rates that will work for your project schedule and budget.